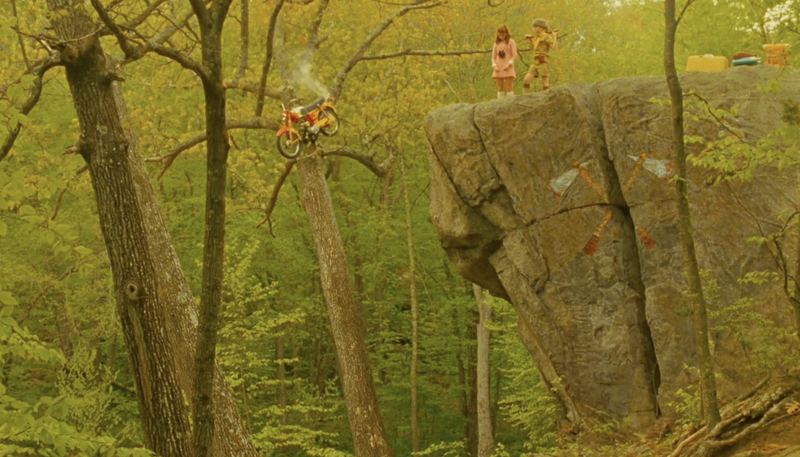 'Moonrise Kingdom' is happiness and affirmation in humanity distilled down to 94 minutes and projected onto a screen. It's a laser-guided riposte to the critics of Wes Anderson who moan that he makes the same beautiful but detached film over and over again. Every frame of this film is instantly recognisable as a Wes Anderson film - to the extent that if any director working today in Hollywood can be considered an auteur, it's Anderson. 'Moonrise Kingdom' is set in 1965 and follows the adventures of two 12 year olds, Sam and Suzy, as they attempt to escape a society which has left both of them troubled and miserable. We also follow their parents and the authority figures on the island who are trying to catch them. It's a common complaint that 'all' Wes Anderson's films feature emotionally stunted adults struggling to get over past psychological injuries. The prime example, from the ur-Wes Anderson film are the three Tenenbaum children from 'The Royal Tenenbaums', but in the same vein we also have the brothers of 'The Darjeeling Limited', Max Fischer and Herman Blume from 'Rushmore' and Bill Murray's reluctant father Steve Zissou in 'The Life Aquatic'. 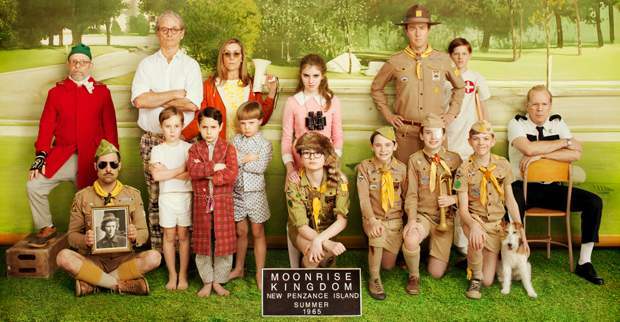 'Moonrise Kingdom' at first seems like an almost overly direct continuation of these themes. All of the adults in this film are miserable and somehow lost, and on surface inspection our troubled child leads seem to be heading the same way. Our male lead, Sam Shakusky (Jared Gilman) is a resourceful but somewhat antisocial and unpopular Khaki Scout (a direct analogue for Boy Scouts). As we begin the film he has just 'resigned' from his Khaki Scout troop and escaped into the wilderness with a stolen canoe and supplies. We learn quickly that he is an orphan, and seems to have been bounced from foster home to foster home. For someone who is apparently 'the most unpopular kid' in the Khaki Scouts, he also seems to be the most competent. His uniform is bristling with badges for various achievements, and throughout the film his outdoors skills are consistently portrayed as top notch. Escaping with Sam is Suzy Bishop (Kara Hayward), 'a very troubled child'. She is the older sister of three young boys and lives with her parents in a very chic island house. She is desperately unhappy, and has a reputation for sudden acts of extreme violence. Her parents do not understand why she is so unhappy, and do not quite understand what to do with her. We are introduced to her from Sam's POV as he escapes backstage during a children's production of Noah's Ark. She is dressed as a raven, and when they meet backstage the two instantly recognise a kindred 'outsider' spirit in the other. Through a series of letters they quickly resolve to run away with each other and escape their various miseries. On first reading, these two children seem like 'Tenenbaums-to-be'. It is easy to imagine Sam growing up to become Max Fischer, or Suzy to become a Margot Tenenbaum. What separates them from previous Anderson characters is that these two can clearly see the misery in their futures should they carry along the path they're on and make a decision to pre-emptively get away from this. So why is this society they're being raised in so damn unhappy? They live on an idyllic island and everyone seems to be comfortably well off. It doesn't even strike us as an overtly authoritarian world to grow up in. There are a number of different authorities in the film, and all are painted in different, but similar colours. Suzy's parents, Walt and Laura (Bill Murray and Frances McDormand) are never shown as intentionally malevolent. Suzy has three younger brothers, and they all seem reasonably normally adjusted, and there is never any suggestion that Suzy's parents do not care about her. Later in the film we are shown a book that Suzy has found hidden in the house: 'Caring for the Very Troubled Child'. It's clear that rather than trying to pose as antagonists, they are trying to find some way to reach out to her, but unfortunately they are going about it in totally the wrong way. The two are lawyers, and live in a loveless and passionless marriage, it seems that all they discuss before falling asleep is the success of applications they've made before various judges. As a result, and seeming out of desperation, Laura is having an affair, and frankly is not doing a very good job of hiding it, leading to Walt's emotional numbness and detachment. Their difficulty in communicating with Suzy is spelled out in a pretty overtly literal manner - their mother walks around the house with a megaphone searching for her, both amplifying and distorting her voice. The other authority figures on the island are Captain Sharp (Bruce Willis) and Scout Master Randy Ward (Edward Norton). Again, as with Walt and Laura, they are not presented as tyrannical, overbearing figures, but as somewhat confused and slightly sad people. They are both never anything less than kind and fair with the application of their authority. Captain Sharp appears to be the only policeman on the island, and when we see him framed with fishing paraphernalia in his opening shot we immediately understand just how busy his job is. Captain Sharp is having an affair with Suzy's mother Laura, although frankly this seems more borne out the fact that there doesn't appear to be anyone else around to have an affair with. They're both damaged people looking for someone to confide in. Scout Master Randy Ward isn't as obviously swirling around in the whirlpool of misery as the other adults, but nonetheless he is still experiencing a sense of gnawing ennui in his life. He seems unready for the responsibility placed upon him. When asked early in the film what his job is he responds 'Mathematics teacher', but quickly corrects himself by saying he's a Scout Master, and Mathematics teacher on the side. As with Captain Sharp he seems to care deeply about the children under his responsibility, and we clearly see his concern and worry about Sam and Suzy as he records his daily log in his tent. He is kind, but it is telling that his repeated excuse for not knowing the Sam is an orphan is that "it wasn't in his record". Talking to him directly appears to have escaped him. All of the adults on the island are thus entirely sympathetic, and we are repeatedly shown their genuine concern and worry for the runaway children. So in the face of these perfectly reasonable authority figures, why do our protagonists decide to fly the coop and head off into the wilderness? Well, apart from their sympathy they all have one further thing in common, they have subsumed their personal responsibilities to various cold and impersonal sets of rules and codes. Walt and Laura's parents repeatedly cite laws and regulations in support of their arguments (and refer to a book to try and work out the 'rules' for dealing with their troubled child), Randy Ward sticks rigidly to the Khaki Scout rulebook and Captain Sharp is the policeman, so works according to the word of the law. All of these characters have to various degrees abdicated their sense of individuality and decision-making to cold, impersonal forces. The ultimate expression of this theme in the film is Tilda Swinton's 'Social Services'. She has totally subsumed her own identity into that of the authority she represents. The character has no name, and refers to herself in the third person as 'Social Services'. She speaks in direct and commanding statements, "Just find the boy, and deliver him to Social Services. Nothing else is in your power." As an adult character she stands apart from the rest, an intruder into their pastel-coloured island community in her stark blue cloak. It is important than even though she is the expression of authority taken to its extreme, she is never portrayed as acting consciously wickedly. The rules say that Sam should be in 'Juvenile Refuge' and given electro-shock treatment, and she is just executing those orders. It's not a personal vendetta, and even though the end result of her plans is horrific, you know that the character sees it as an unpleasantness in aid of the greater good. The cinematography and direction underlines these themes. The environments the adult characters inhabit are consistently portrayed as boxes, a collection of right angles and severe lines and sharp colour delineation. The Bishop house is the clearest example of his, and the opening shots of the film demonstrate precisely how we are to view the architecture of the place. The camera moves along a dolly, turning at sharp right angles in perfect parallel lines to the layout and inhabitants of the house. It's like looking into a dollhouse, an instantly recognisable Wes Anderson shot. Here it serves us thematically, boxing Suzy in. In contrast, the child escapees inhabit the natural world, as free within the frame as they are in the plot. 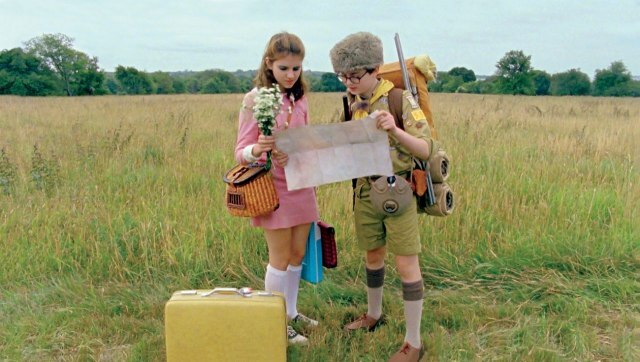 Theirs is a world of long, looping curves, be it the sweep of the beach they fall in love on and name 'Moonrise Kingdom', or the 'Chickchaw Harvest Migration Trail' they follow on their adventure. Faced with admittedly sympathetic yet constricting reality it is important to understand exactly what form the children's rebellion takes. They do not abandon civilisation and rules for a wild, anarchistic existence - quite the opposite in fact. They bring as much of civilisation as they need along with them on their journey. It's notable that Suzy's suitcase doesn't contain clothes and supplies, but rather books. She brings her kitten, a record player and a supply of cat food. Even in their rejection of the adult society, Sam still follows the survival rules taught to him in the Scouts, and survives admirably. Once they have been caught, the Scout Master praises Sam on the layout of his beachside campsite. But even though they have brought some of the trappings of the outside world with them, there are huge differences between the interactions of the adults and that of Sam and Suzy. The two children act at all times with complete emotional nakedness. They only ever say precisely what they feel and seem to act at all times with utter honesty. They know exactly what they feel at any given time and act accordingly. Their romantic relationship is so pure and reflexive that there is not too much to say about it other than that they love each other, and therefore should be together. Much of the conflict in the film is generated directly and indirectly by the adults trying to process this unshakable partnership. They simply do not have a frame of reference for it. It's kind of annoying that Wes Anderson films are often accused of being overly ironic and detached. These kinds of heartfelt and genuine romantic attachments pepper his films and are generally treated utterly sincerely. There are some pretty brave scenes in the film exploring juvenile sexuality, which is a tricky subject for a director to tackle without making the audience feel a bit creepy. Anderson neatly sidesteps the issue purely by dint of the the sincerity and care with which he builds and develops the relationship. The pivotal scene thematically in terms of the characters being governed by external rules is the marriage scene. The characters have escaped to 'Camp Lebanon' where an older boy 'Cousin Ben' (Jason Schwartzman) claims to have the semi-authority to marry them. In a great piece of dialogue he spells out that the marriage will not be at all legally binding in numerous specific ways. The characters are essentially acting out a ceremony with no authority given to it all. Sam and Suzy are repeatedly asked if they're sure they want to go through with this, and told that this is an important decision that will affect them for the rest of their lives. They are 100% sure, and are married. The film does not treat this marriage as anything less than the real thing. It is the clearest demonstration of what the film is trying to say about authority and rules: they are what you make of them, and only binding in so far as you acknowledge them. As far as the film is concerned, there is no difference between a full legally sanctioned marriage, and Sam and Suzy's. Throughout the rest of the film we have seen that sticking rigidly to the rules without consideration leads to misery and inaction and the seriousness of this ceremony accentuates it. This is further underlined during the climax of the film. Sam and Suzy have climbed to the top of a church tower to escape the adults. A storm rages, and the adults are panicking downstairs trying to figure out a way to save them. Their solution is to utilise all their knowledge to work out a way within their particular sets of rules to save the children. Suzy's parents work out a legal argument to save Sam from Social Security, who frantically flips through a her rulebook to see if it works. It does, and Sam is adopted by Captain Sharp, who has climbed the tower and gained Sam's legal consent to do so. In the closing scene of the film we see how Sam has switched his outfit to co-opt the police authority of his new adoptive father Captain Sharp. The impotence of rules and regulations against external forces are repeatedly demonstrated by Anderson throughout the film through natural forces (the storm) and the sheer, unshakable, romantic attachment of the two leads. The film is telling us that authority and rules have no inherent, absolute value, and that systems of control must prove their worth and utility. Anderson shows us that those who wield authority have choices as to whether to apply it either coldly without emotion or with humanity and sympathy. I had a wonderful time watching this film, as I have every other film by Wes Anderson. His casting choices are inspired, and the two leads are an astonishingly effective piece of casting. There are those who criticise him saying that he makes the same film over and over again. It's a regressive view, and begs the question exactly what are the films he should be making? 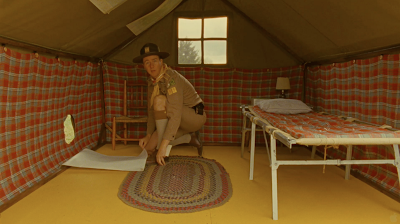 Everything about this film, the cinematography, the soundtrack, the costumes and set design is pure Wes Anderson, and it's wonderful to see a director with such a clear idea of what he wants his film to be. You'd have to have a heart of stone not to be touched by this.